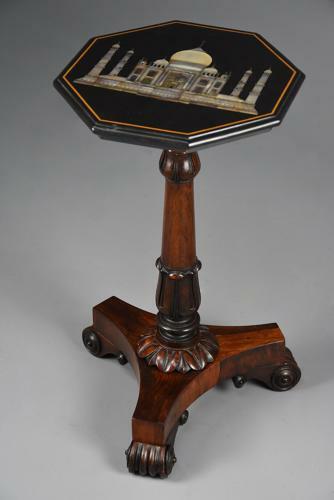 The top is supported by a solid rosewood tri-form base with carved column with foliate carved decoration leading down to a turned and carved foliate collar below. The table is supported by a tri-form base with three scrolling feet. The Taj Mahal is a marble mausoleum on the banks of the Yamuna River in the Indian city of Agra. The Mughal Emperor, Shay Jahan, commissioned the building in 1632 for the tomb of his favourite wife, Mumtaz Mahal, and the work was not completed until 1653: it is regarded as one of the best examples of Mughal architecture and continues to attract millions of visitors each year and is one of the New Seven Wonders of the World.